The oxygen data collected on this cruise have not been calibrated against sample data and should be used with great caution. The SBE 13 was designed as an auxiliary sensor for Sea Bird SBE 9plus, but can fitted in custom instrumentation applications. When used with the SBE 9 Underwater Unit, a flow-through plenum improves the data quality, as the pumping water over the sensor membrane reduces the errors caused by oxygen depletion during the periods of slow or intermittent flushing and also reduces exposure to biofouling. The output voltage is proportional to membrane current (oxygen current) and to the sensor element's membrane temperature (oxygen temperature), which is used for internal temperature compensation. Two versions of the SBE 13 are available: the SBE 13Y uses a YSI polarographic element with replaceable membranes to provide in situ measurements up to 2000 m depth and the SBE 13B uses a Beckman polarographic element to provide in situ measurements up to 10500 m depth, depending on the sensor casing. This sensor includes a replaceable sealed electrolyte membrane cartridge. The SBE 13 instrument has been out of production since 2001 and has been superseded by the SBE 43. Documentation for the CTD data collected on RRS Challenger 97/92 (September - October 1992) by the Dunstaffnage Marine Laboratory, Oban, Argyll, Scotland, UK, under the direction of D. J. Ellett. The instrument used was a Seabird 9/11 CTD, and the data were processed using the Seabird software. The manufacturer's calibrations were used. Data have been averaged to 1 decibar values. The North Channel region, between Northern Ireland and the west coast of Scotland, has been extensively surveyed since the late 1970s (especially in the 1980s) by numerous research and government institutes. The region contains several repeated hydrographic stations, some of which collectively form transects. These repeated survey transects represent the southernmost part of a greater network of similar sections on the western Scottish continental shelf which were established by Dunstaffnage Marine Laboratory (DML). Map produced using the GEBCO Digital Atlas. The upwards-pointing triangles indicate the nominal positions of individual Line A stations, the single downwards-pointing triangle indicates the nominal position of the Larne - Stranraer midway station. Nominal positions of Line Y and Z stations are shown by the circles and squares respectively. Measurements made at Northern Channel CTD stations lie within a box bounded by co-ordinates 54.667° N, 6° W at the south west corner and 55.283° N, 5.083° W at the north east corner. Line Z is a survey section in the North Channel between Northern Ireland and Stranraer (Scotland). 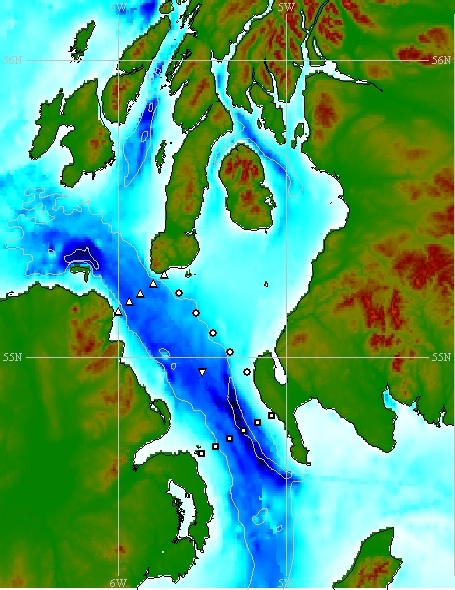 The line comprises six fixed CTD stations, which were established as part of routine monitoring work on the Scottish continental shelf by Dunstaffnage Marine Laboratory (DML). The line was occupied in the 1980s and 1990s. Station 1Z is one of six fixed CTD stations between Northern Ireland and Stranraer (Scotland), established by scientists at Dunstaffnage Marine Laboratory (DML).